Ornamental grasses are becoming increasingly popular, and there is now an over-abundance of options available at garden centers. So many choices can make the selection process difficult, even overwhelming. There is one ornamental grass, however, that takes the cake. Pink Muhley Grass is arguably the most colorful ornamental grass around and it is sure wow your friends and neighbors. Pink Muhley Grass (Muhlenbergia capillaris) is a native grass that is deer, drought and salt tolerant. It is hardy in zones 7-10 and may be grown as an annual elsewhere. Broadly adaptable, this grass prefers sun but will tolerate part shade and will grow well in just about any soil type. ‘Regal Mist’, or also called ‘Lenca’, is a cultivar known for the deepest plume color. Perfect used as a specimen plant in containers or in groupings in beds and borders as well as naturalized in a meadow garden, this fall bloomer is an outstanding ornamental plant. The pink-purple flower plumes that grow up to 4 feet are also exceptional for use in cut and dried floral arranging. This ornamental grass is very easy to care for. Simply prune your Pink Muhley Grass clump back hard in late winter or very early spring before the attractive new growth begins to show. Although drought tolerant, the plant will be fuller and lusher with regular, consistent watering. It is especially adaptable to poorly drained soils, and can grow in full sun or partial shade locations. When not flowering, the green clump creates a textured mound acting as a groundcover or background for other smaller plants. It can also soften harsh garden corners, walkway edges or awkward intersections. As a finely textured grass, plant Pink Muhley Grass with contrasting companions such as calla lilies, evergreen shrubs or low growing groundcovers to create interest in the landscape. Plant in front of the larger smoketree Cotinus coggygria ‘Grace’ for an exquisite coordinating display of color and texture. Plant where it will be backlit. It positively glows where it catches the early morning or late afternoon sun. Use as a beautiful and unusual addition to floral arrangements. 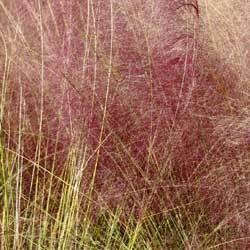 Do you need another reason to grow Pink Muhley Grass? Oh, yes, the birds will thank you – they love the seeds!